A seven-striped flag was in existence from 1850-1870. It featured three narrow horizontal stripes of blue, white and red with a wider yellow stripe in the center, and a second set of narrower stripes in red, white and blue. In 1871 a new flag emerged featuring three vertical stripes of sky blue, white and sky blue. In the center of the white stripe is the coat of arms with images of two crossed swords and two crossed guns. Flanking these images are two olive branches and on top is the Quetzal bird. The date "Libertad 15 de Septiembre de 1821," is inscribed in gold at the center. 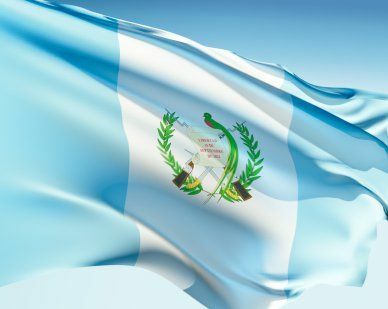 Our top-quality Guatemala flags conform to all official specifications. Emblems and designs are executed with the highest possible degree of accuracy in regard to detail, color shades, placement and proportion to flag size.